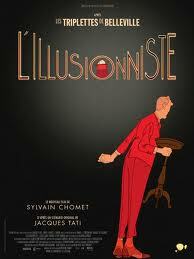 The Illusionist is eking out a living during the dying days of the music halls. Travelling to the Scottish islands for one of his performances, he meets a girl called Alice who’s convinced he’s a real magician and follows him to Edinburgh. The Illusionist is reluctant to disappoint her, but as she begs for gifts that she’s convinced he can magically provide, he has to come to terms with the fact that he has little money coming in and no means of keeping her illusions alive. Directed by Sylvain Chomet (Belleville Rendez Vous), this is an animated, near wordless, tale for adults. The story was written decades ago by the great French comedian Jacques Tati, who found absurdity and pathos in the minutiae of everyday life. Apparently, however, Tati found this script too personal and shelved it during his lifetime, but Chomet has taken it and revived it as homage to Tati, to cinema, and to Edinburgh. This is a bittersweet, poignant film about loss, grief and shattered illusions. However, like life, it’s also humorous and beautiful. Hmmm, I was kind of bored by “The Triplets of Belleville” to be honest – though I appreciated it’s artistry – and for all the praise given to Jacques Tati over the years, I finally saw his masterpiece – “Playtime” – and I believe the man was good, but overhyped. (I found his antics not funny…interesting sure…but I didn’t laugh. The early silent film stars were more inventive than Tati as well as a lot funnier. And Rowan Atkinson as Mr. Bean, certainly in the tradition of Jacques Tati, was way funnier and even more creative than Tati…soooo, if Tati had a hand in this script, then I’m also on the fence about seeing it. HOWEVER…Miss Jelinek’s review – as only good reviewers can do – has made me WANT to see this film. So once I do, either I’ll be delighted and give props to the director and Tati, or else proclaim I was right and should have stayed away. Oooh, what will I say?? Thank you for your comments, and I do hope that if you see the film that you enjoy it. Please do keep in mind that like books, there are films for every mood and what you’re mood is at the moment you read/watch a given book or film can affect your experience of it, so in my mind, it’s important to be in the mood for subtle, cerebral, and sweet when you watch this. I kind of agreed with Jacques Tati – it was a very personal sad film. In fact the French word triste exactly conveys the feeling for me. Being an old softie that meant it was hard to enjoy what was actually a beautiful film. Requesting perhaps not demanding. But still.